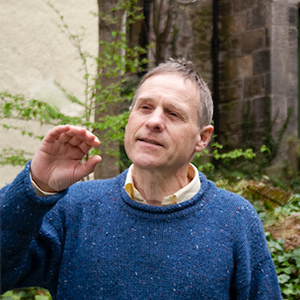 This week on the Teller and the Tale, we remember storyteller Andy Hunter, who sadly passed away last January 2015. Andy was only 60 years young. Andy will be remembered by his family and friends, of course, as well as many in the storytelling community. His appearances at the Scottish Storytelling Centre and the Guid Crack Club were always much loved. Andy was a consummate storyteller with a wry sense of humour. Like first-class storytellers, Andy could inform, entertain, and inspire all at the same time. He applied his storytelling talents to his other love: bike riding. Andy was the founder of StoryBikes, taking folk out on bike journeys to different parts of the country and even across to Europe. Not only did you get much needed exercise and fresh air, but you got stories along the way, helping you experience the land and its history in an unique way. In this week's episode (first broadcast last year), we hear Andy tell a couple of his favourite stories. As a number of people have already remarked, it's wonderful to hear Andy's voice again. Broadcast times: Sunday 17 January 2016 at 7am EDT (Canada/US), 12 noon (UK/Ireland), and 9pm Australia. Rpt on Thursday 21 January at 4pm EDT (Canada/US), 9pm (UK/Ireland) and 6am on Friday in Australia.